Don't forget that Hillary killed those men. Henry R. K. from Ballston Spa, NY signed. I want the responsible person or persons to be made accountable and punished. GTMO is waiting for them. Michael J B. from Mesa, AZ signed. Hillary and Obama were treasonous to falsely try to blame a viedo and were not on the job period! They both need to go to prison. Someone from Minneola, KS signed. Jim A. F. from South Haven, KS signed. Marie S. from Grand Prairie, TX signed. Someone from Auburn, GA signed. Tanq M. from Woodstock, GA signed. Gayle R. from Fontana, CA signed. John M. from Gardena, CA signed. Gloria S. from Staten Island, NY signed. I want Hillary Clinton, President Obama and All others involved in this Scandal be forced to tell the real truth and make them to be held accountable for the Death of Those 4 Men in Benghazi!! They both lied and are hiding the real truth regarding the murders. As a, Army Combat Medic Veteran, I Demand that my 3 fellow Brothers and Ambassador Stevens , whom were killed on that terrible day. 3 years ago, on 11 Sept 15. These 2 people and the others who stood by as those men Cried out for support/and or backup. This is an Outrage!! The responsible people in our government needs to be proscuted. Our military was ready to move. Jaames R. from Barnegat, NJ signed. Linda P. from Orem, UT signed. Craig B. from Overland Park, KS signed. It makes complete sense to finish the job investigating Benghazi. If there is nothing to hide they would fully cooperate and get the investigation done that way. Every bit of information has to be transparent in order to have an honest administration. If they are allowed to hide the corruption goes without consequences and the corruption continues to fester and grow for years to come. Keep the people in order from the top to the bottom honest with transparency and accountability. You can't expect to hold citizens accountable if you can't be accountable yourself. Every single life matters. If the administration as anything to do with it they must be held accountable and respect our country and what it stands for. Let's clean up the corruption and the people in office that are looking out for themselves and looking to make a career off the tax payers hard earning money. Let's protect the lives of our service men and women and the lives of our citizens. No more lies, corruption, deception, withholding and hiding information, spending tax paper money, illegal immigration tactics, etc.!!! It has to stop! Walter T. from Mesa, AZ signed. Judy P. from Haughton, LA signed. The truth needs to be fully vetted and and shared with Americans without political alteration! 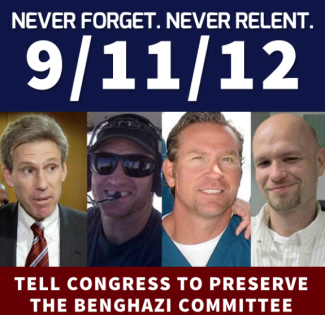 The Bengazi Committee MUST continue to its end! THE BENGAZI COMMITTEE NEEDS TO CONTINUE. William D. from Daytona Beach, FL signed. Carolyn C. from Laurel, MD signed. Honorable D. LaMalfa, The Benghazi Select Committee must see be allowed to reach a full and fair conclusion or the matter at hand will never be forgotten ... both in it's rightful context, and when it comes to the re-election and support of members who failed to support The Committee's viability. Sharon C. from Middleport, OH signed. Fred H. from Jupiter, FL signed. The whole truth needs to come out. We need to find out who gave the order of STAND DOWN and let our people die. These Four who died needlessly should have justice. Those in our government, who did nothing to ensure their safety, need to answer for what they didn't do in protecting American lives. They could have been saved but inaction cost their lives and tore apart their families who have to live with the loss of a beloved family member. Time for justice. Trying to dissolve this committee is a political ploy to misdirect Hillary Clintons misdeeds while Sec of State and running for President! This committee needs to remain in place for finding out who was responsible for the deaths of our people in Benghazi. Democrats are the ones who would like this to go away for political reasons! This is about the truth, not politics! Thomas K. from Livingston, TX signed.